Why? Well, I haven't run without shin splints for 12 years. Meaning: I have rarely run in the past 12 years because it is so painful and not really beneficial. BUT I have always been jealous of people that could, because it is such an easy way to get skinny/fit. Well, a new friend recently told me about "barefoot running" and how it was supposed to be so much better for you, with less incident of injury, etc. Then she told me about the Nike Free, and that how it was supposed to be very close to barefoot running, while still wearing a shoe. I was skeptical because I have almost flat feet and the shin splint problem, but she told me she and other friends had had similar problems EXCEPT when they ran in the Free. I was SO excited that I ran out and bought myself (and my husband) a pair the next day. And I have now run in them 3 times with NO SHIN SPLINTS!!!! I ran for 43 minutes the other day. I couldn't believe it. I am so excited and so I wanted to tell the world! Hope this helps someone else out there! And yes. I bought the bright pink pair. I love them. I totally know how you feel! 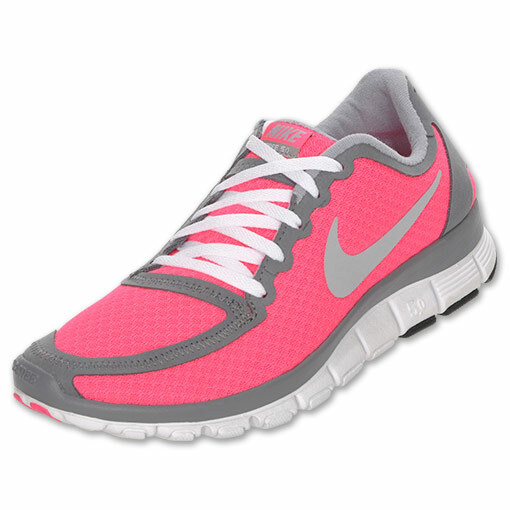 I just got some new Nikes too and can actually run without crying now! I got the Nike plus edition so I can track my progress and run with my ipod or phone. after a bicycling accident when I was little, running has always given me a headache, so I've never understood the love runners have for running. But I believe you guys LOVE to run. Have you heard of Vibram 5 finger shoes? suppposed to be just like barefooting too. They seem kinda funny at first, I'm really interested to try them, except I don't run. Okay so seriously? You might have convinced me to go out and buy these. Good for yoU! I spent 6 months in the care of a podiatrist last year after getting whatever foot related itis you can name...believe me, I know how important the right shoe is! Happy running! Katie, these are the exact shoes I run in! Aren't they great?! I love them. I've run 5 miles in them when I never thought that was possible. I just got my pair last night and blogged about them this morning only moments before I saw your blog post. I think we may be on to something here! my feel are almost completely flat and nike's have always been terrible painful to wear. i might have to try these though if you say they don't hurt your feet. thanks for the suggestion (and i love the pink!). I've just been reading about the barefoot movement as well. I have really bad joints (I'm 32 and have osteoarthritis!) so I don't run anymore, but I try to walk as much as I can. I've been looking for a new shoe- I love my Nike Shox, but they are old now. I may just try these new guys out! Thanks for the tip:) Happy Running! I don't have shin splints but....do you know of any shoes that magically give you motivation to run? i also do barefoot running although i prefer the vibram 5 finger. i couldnt run because of my bad knees. i tried them out and voila! i can run again. simply amazing! Super cute shoes! I work out in heels... no literally. When I do ballroom, I wear heels :) Cardio gets tennis shoes, though! cutest running shoes ever and i love the memory game idea! thanks..